(Chino Hills) – Pasadena rallied from a 29 point deficit in the third quarter but fell just short in a 77-74 loss to Chino Hills Tuesday night in the CIF State semi finals. The Bulldogs were down 41-11 in the second quarter and 51-22 in the third before staging a furious rally. A three pointer by Darius Brown II early in the fourth cut the Huskies lead to 59-58 but Pasadena couldn’t get over the hump. The Bulldogs found themselves down 44-20 at halftime and before they took the floor they were down 46-20 when they were hit with a technical foul. A Chino Hills administrator ordered that Pasadena assistant Vahan Parseghian be removed from the game before the start of the second half. When he didn’t leave right away, Pasadena was assessed a technical and Chino Hills converted both free throws. Pasadena Head Coach Tony Brooks wasn’t given an explanation by the officials as to why and filed a protest after the game. Outcome to be determined later. That only seemed to fire up the Bulldogs. The lead hit 51-22 when Pasadena kicked it into high gear. The Dogs went on a 16-0 run to cut the lead to 13. By the time the quarter ended they had turned a flurry of Chino Hills turnovers into three pointers and easy layups and had outscored the Huskies 33-13. Bryce Hamilton buried a three at the end of the quarter to make it 57-53. Tavian Percy hit a pair of threes in the quarter, Brown had nine in the third and Darius Mason clicked inside for six. The once confident Huskies were now on their heels. Pasadena continued to press and push in the fourth and when Brown hit a bomb from the right side early in the fourth a 30 point second quarter bulge was suddenly a scant one. Chino Hills managed to find its composure as Ofure Ujadughele hit a three and a couple of baskets and Oneyka Okongwu scored inside to spark a 13-2 run to go up 72-60. Pasadena had one more run left however. Hamilton hit two free throws to cut it to 75-74 with 27 seconds left. However the Huskies were able to burn the clock down to three seconds when William Pluma was fouled and hit hit two from the charity stripe. Percy’s three at the buzzer fell short and Chino Hills celebrated the pending finals appearance. The Huskies jumped out to a 21-10 first quarter lead behind the inside play of Okongwu who had 10 in the first. Jaren Williams buried a pair of threes early in the second quarter and Okongwu continued to do his thing, it got a little chippy and suddenly the scoreboard read 41-11 Chino Hills. Pasadena tried to climb back into late in the second but again the lead was nearly 30 again early in the third. The fat lady wasn’t singing but she was humming a few bars in the corner. It was over folks. And then, it wasn’t. Hamilton finished with 25 points and 10 rebounds for the Bulldogs, Brown had 21 and 5 assists and Percy added 14. Mason played a huge part in the rally with 8 points and Omari Moore had a steady line of 6 points, 6 rebounds, 7 assists and 4 steals. 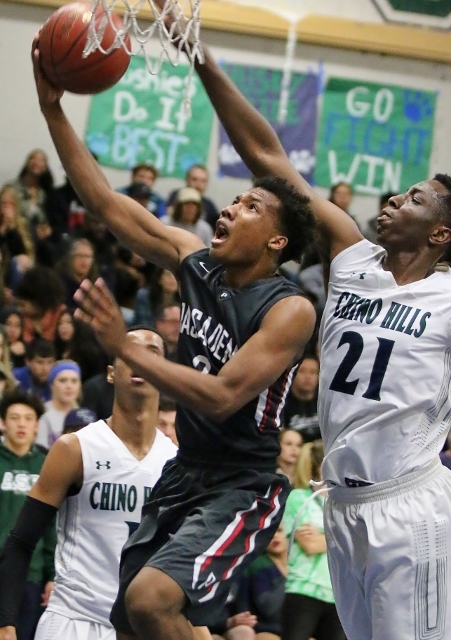 For Chino Hills, Okongwu led the way with 22, Ball scored 21 and Ujadughele netted 17. Williams had 8 – all in the second quarter. 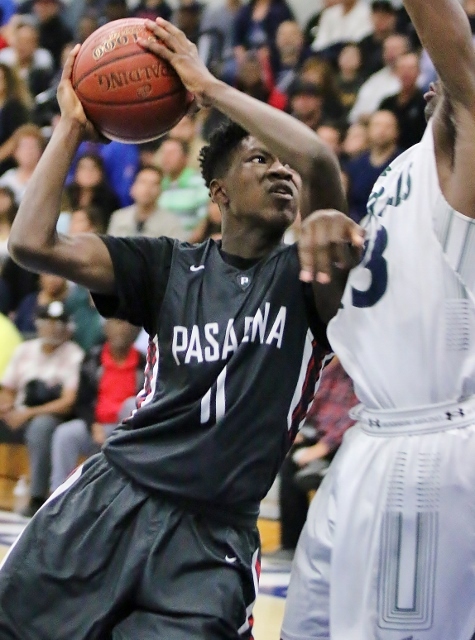 Pasadena finished the season 24-8 overall and was a CIFSS Division 1 Finalist and a CIF State Regional semi finalist. As for the protest…stay tuned. 1 Comment to "Furious Bulldogs Rally Falls Just Short"
I would love to hear more on the reasoning for the tech. I know Dena protested the game.